The science team on IODP Expedition 314 poses on board the world's largest research drilling vessel, the Chikyu Hakken. UCSC geologist Casey Moore is the sixth person from the left in the back row. Photo courtesy of IODP. The first effort to drill into an undersea zone where massive earthquakes and tsunamis are generated has yielded new data on the stresses that build up there, according to Casey Moore, a professor of Earth and planetary sciences at the University of California, Santa Cruz. Moore took part in an eight-week scientific drilling expedition off the Pacific Coast of Japan, as part of the launch of the Nankai Trough Seismogenic Zone Experiment (NanTroSEIZE), an international research initiative supported by the Integrated Ocean Drilling Program (IODP). "What we're trying to understand is the earthquake cycle--what makes these faults move, when they do," said Moore, who was involved in the conceptual planning of the experiment. "Right now the fault is locked, the rubber band is stretching, and it's going to break probably in the next 50 years. We want to know what brings it to that breaking point." Unlike previous ocean drilling projects that explored basic plate tectonics, NanTroSEIZE specifically aims to understand the triggers and mechanisms that lead to earthquakes and tsunamis. NanTroSEIZE will also attempt the deepest ever drilling penetration in a seismogenic fault zone, conducting both sampling of the rocks and monitoring of the seismic cycle there. The drilling site, an area called the Nankai Trough, is located off the coast of Shingu, Japan--a sister city of Santa Cruz. The Nankai Trough marks the boundary between two of Earth's major crustal plates, where the Philippines Sea plate rams into and slides under the Eurasian plate. Centuries of Japanese records suggest that this subduction zone has generated many large earthquakes, including one of magnitude 8.1 in 1944 and another of magnitude 8.3 in 1946. According to Moore, the combination of a thrust fault and an off-branching splay fault at this location creates the potential for a huge and sudden uplift of the seafloor--on the order of 10 to 20 meters. Such a disturbance can lead to a giant tsunami wave, similar to the one that struck the Indian Ocean region on December 26, 2004. "A subduction zone like the Nankai Trough can generate the world's biggest and most damaging earthquakes and tsunamis, so there's good reason to drill there," Moore said. Researchers working with NanTroSEIZE will be the first to drill deeply in this type of seismic hotbed, Moore said. A different type of seismogenic zone is being explored on land by U.S. Geological Survey researchers who have drilled into California's San Andreas Fault, a strike-slip boundary where two plates slide past each other. As part of NanTroSEIZE Expedition 314, Moore worked aboard the world's largest research drilling vessel, Chikyu Hakken (Japanese for "Earth Discovery"). The new vessel and its crew left Shingu Port on September 21. 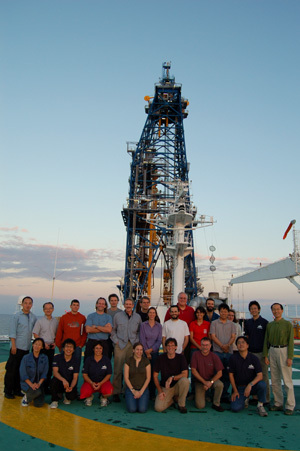 Moore helicoptered off the ship on November 16, but the Chikyu will continue this drilling program into February 2008 with other scientists on board. In this part of the experiment's first phase, 16 onboard scientists from six countries conducted logging-while-drilling operations at five sites. They drilled between 400 and 1,400 meters below the seabed and logged data on the physical properties of the rocks and sediments that have piled up at the fault zone to form an undersea mountain range. Moore measured the stresses pressing in on the boreholes by collecting images and analyzing the boreholes' failure patterns. His goal was to figure out how the strain is distributed and how the faults are oriented. "The most exciting thing was getting an unprecedented record of the stress accumulating between major earthquakes in a subduction zone," Moore said. "From the failure patterns, we can determine the orientation of the stress. We have the directions nailed right now." Findings from Expedition 314 were presented at the annual meeting of the American Geophysical Union in San Francisco, where Moore participated in a news conference on December 12 entitled, "Undersea drilling reveals mechanics of earthquakes, tsunamis." The panel discussion was led by Harold Tobin, co-chief scientist of the expedition. Tobin is a geologist at the University of Wisconsin-Madison and an alumnus of UCSC. Ultimately, NanTroSEIZE is expected to give researchers access to the "seismogenic zone," where earthquakes are generated. To do this, the experiment will proceed in four phases through 2012, eventually drilling through the crust and into the Earth's mantle at a depth of 6 kilometers. "It's a learning process," Moore noted. "We have to take small steps because it's a hostile environment that's difficult to work in. When we get to 6 kilometers the challenges will be huge." In 2009, Moore is slated to serve as co-chief scientist of an expedition, sharing duties with a researcher from the Japan Agency for Marine-Earth Science and Technology (JAMSTEC), a leading research institution in Japan. By then, the team expects to begin using a technique called riser drilling to probe the mega-splay fault zone at 3,500 meters below the seafloor, he said. At that point, Moore said, he looks forward to making another set of measurements that have never been collected before. "More than anything, we'd like to know what the variation of water pressure in that fault zone is," he explained. "That's critical because fluids push the two plates apart and can also allow the faults to slip." In the final phase of the drilling experiment, researchers plan to install observatories--sets of instruments deep in the seismogenic zone that will allow them to monitor changes. The scientists hope to identify precursors that signal when a major earthquake is about to happen. More information about NanTroSEIZE can be found on the expedition's web site. Note to reporters: You may contact Casey Moore at (831) 459-2574 or cmoore@pmc.ucsc.edu.